Theoretical calculations based on the BCS phonon-mediated theory of superconductivity indicate that highly compressed solid hydrogen and main group hydrogen-rich materials can possess high Tc in predicted high pressure metallic states due to the existence of hydrogen-dominated vibrations. This proposal has motivated the search for superconductivity in these materials using both theoretical and experimental approaches. Hydrogen sulfides have recently attracted a great deal of attention due to the record high Tc of 203 K observed on compression of H2S [A. P. Drozdov et al., Nature 525, 73-76 (2015)]. 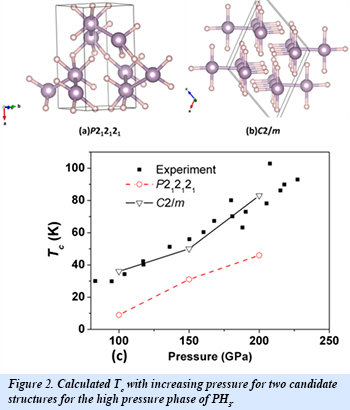 In recent work at Carnegie, a joint theoretical and experimental study has been carried out to characterize the dissociation products of compressed H2S. This information is essential for an understanding of the complex superconducting states observed in the hydrogen-sulfur system. In simulations, it is found that H2S partially decomposes into S+H3S+H4S3 above 27 GPa, and H4S3 emerges as the major component at around 66 GPa. X-ray diffraction (XRD) measurements reveal a small fraction of H3S and residual H2S at least up to 140 GPa, which are believed to be responsible for the two superconducting states observed in experiments. This work provides the first XRD evidence on the existence of H3S at high pressure from the decomposition of H2S. Calculated Tc values for H4S3, H2S, and H3S are compared to experimental data measured in compressed H2S, where Tc values have been obtained for samples prepared at low (L-Tc) and high (H-Tc) temperatures (Fig. 1). Although the value of Tc for Im-3m structured H3S calculated within the harmonic approximation is much higher than the observed H-Tc, the inclusion of anharmonic effects reproduces the H-Tc data above 180 GPa very well. The predicted Tc for R3m-H3S increases with pressure, in stark contrast to the experimental observation of a decrease in H-Tc. Further study is required to understand the steep increase of L-Tc above 160 GPa and the high value of H-Tc at around 150 GPa. Recently, two possible candidate structures for compressed PH3 have been elucidated using first-principles electronic structure methods (Fig. 2). Both the calculated values for Tc as well as the pressure dependence of Tc based on BCS theory agree well with experiment, further supporting proposals that high critical temperatures can be realized by a phonon-mediated mechanism. In a related study [A. Shamp et al., J. Am. Chem. Soc. 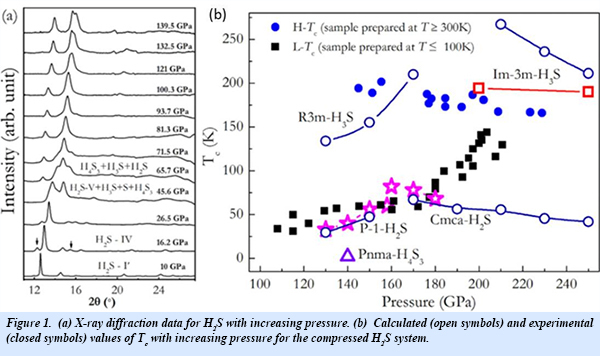 138, 1884-1892 (2016)], similar results were obtained for a PH2 composition, obtained by the decomposition of PH3 to PH2 and molecular hydrogen at high pressure [H. Liu et al., J. Phys. Chem. C 120, 3458-3461 (2016)].